You may remember Roz’s enchanted forest in the Creative 360 gallery in 2013. This video made at the time is a wonderful reminder of Roz’s beautiful creation. A native of Saginaw, Roz Berlin is one of Michigan’s foremost fiber artists. 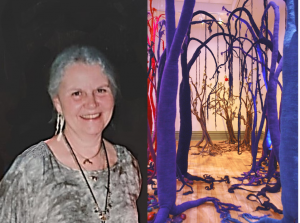 She is best known for her woven forest that began with a single tree she created for her son’s bedroom as a nod to the book, “Where the Wild Things Are” by Maurice Sendak. From that tree grew her forest of trees that range in height from 2 to 15 feet. Two of her trees are part of the Yes We Can! Exhibit on display through February 17. Roz holds degrees in art education from Michigan State University, and in counseling education from Central Michigan University. She studied fibers and fiber art across the Americas and in the U.K. She also taught art in both private and public organizations. Roz has received countless awards, including the “All Area Arts Award” in 2011. She has exhibited in galleries, museums and universities. If you know of someone who is (or will soon be) 80 or above and should be considered as part of future Yes We Can! programs, please contact Creative 360 at 989-837-1885 or by email at creed@becreative360.org.